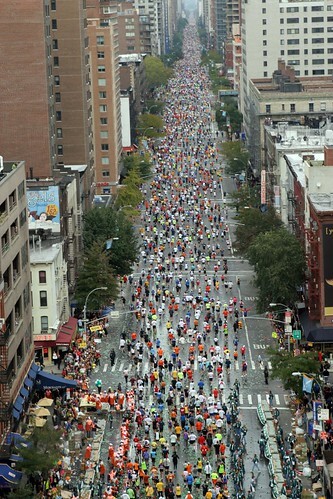 Could the New York Marathon still help the Sandy relief effort? So the New York City marathon has been cancelled by Mayor Bloomberg. Of course it’s the right decision, but it should have been made earlier. If there are still bodies being pulled from wreckage then a major sporting event is just a distraction from the relief effort. If the relief operation was a little further along the track then this could have been a great opportunity to see the city pull together around a major sporting event – to show the world that New Yorkers really can pull together and recover from any adverse situation. But the situation is obvious – while some TV cameras would be following runners along the streets, others in the media would be pointing out the ongoing relief effort and suggesting that 40,000 fit people with an entire Sunday free might want to do something more useful than just jogging around the city. So the decision is right, but in all the debate I have seen so far, nobody has mentioned that the marathon itself is an enormous fundraiser for many charities. It’s not 40,000 middle-class folk just taking a stroll – many of those people have trained all year, setting the marathon as an enormous personal challenge that has allowed them to raise sponsorship and support for a chosen charity. In the London marathon over 80% of the runners are doing it just to raise cash for good causes. New York is not quite at that level of charity runners yet, but let’s just do some sums. Most charities will ask a runner to get a minimum amount… $2,500 to $3,000 is common for New York. So if 80% of the 40,000 New York runners are raising at least $3,000 then that is almost $100m being raised for charity from a single race. It could even be more if you assume that most runners will be raising more than the minimum expected. The way it works is that the charities buy a guaranteed place in the race – they have to pay up front for a place and many charities will buy dozens or even hundreds of places. Then by ensuring runners get a minimum amount, the charity can ensure they raise a lot more than the places cost. Everyone wins. If the race is now cancelled then what happens to all the money pledged by people who were supporting the runners? One obvious answer here is to refund the charities all the money they invested in buying places in the race and to then ask runners to divert all the funds they would have raised from the race into the relief effort instead of their chosen charity. That could put $100m on tap almost overnight and would ensure that cancelling the marathon still created something worthwhile for the city. It’s difficult though – many choose a charity to support for very personal reasons and some might feel that if they have gone to the effort of raising the cash then they should have some say in where it goes. I don’t know if the Mayor and the marathon organisers can get organised fast enough to make it work, but they need to make some fast decisions, because after the dust settles, hundreds of charities will be asking about their missing millions if nothing is done.